I spent my elementary and high school years at Holy Infant Academy(HIA), a private school in Calapan City, Oriental Mindoro where there is this yearly celebration called feast day. It is when we celebrate the feast of a patron saint assigned to each grade level. This means no class…just whole day of fun and play! Since we celebrate it outside the campus, we had to bring lunch with us. I can still remember that I had Filipino-Style Spaghetti and fried chicken drumsticks every feast day since 1st grade to 4th year high school. It’s like I was having a grand meal every time there’s spaghetti and fried chicken...and HIA feast days won't be complete without it! I just love that combination! I guess every Filipino kid does! So what’s in Filipino Style Spaghetti that kids love? Non-Filipino friends who have tasted this all said it tastes weird but is really good. 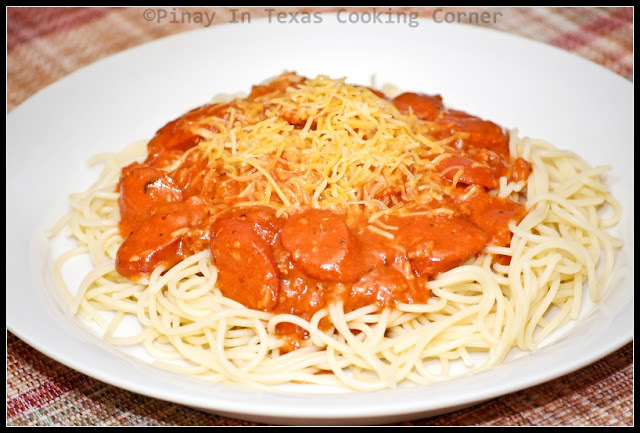 Unlike Italian spaghetti which is full of spices and tomato sauce, Filipino spaghetti is sweet and it has hot dogs or Vienna sausage in addition to ground meat. No wonder Filipino kids love it! I can’t recall any Filipino kid’s birthday celebration without spaghetti on the table. But don’t get me wrong, Filipino-style spaghetti isn’t just for kids! Even Filipino adults love it…and I’m sure you will! Here's my version of Filipino Style Spaghetti. Check it out! 1. In a large pot, bring water to a boil over medium heat. Add 4 tsp salt. 2. Add the spaghetti noodles and cook until tender (see package for cooking time). Drain and set aside. * Check out Pasta Cooking Tips below. 3. 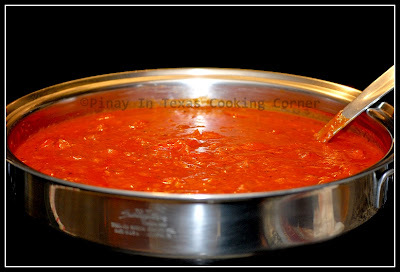 In a large covered saucepan, cook ground meat (sprinkled with a little salt & pepper) in ¼ cup water over medium low heat until water evaporates. 4. Push meat into one side of the saucepan. Adjust heat to medium. Add olive oil. When oil is hot enough, add garlic and sauté until golden brown. Add onions and sauté until almost translucent. 5. Add beef franks or hotdogs. Mix ground meat together with garlic, onions and franks. Add beef cube and keep stirring until it melts. 6. Pour the spaghetti sauce and catsup. Simmer for 10 minutes. Add sugar and fish sauce. Simmer for 3 minutes. 7. Add milk, parmesan and cheddar cheese. Add salt and pepper to suit your taste. While stirring, continue to simmer for 5 more minutes. 8. Place spaghetti pasta on a plate then top with sauce and sprinkle with cheddar or parmesan cheese. 1. Use a large pot. Using plenty of water helps to prevent pasta from sticking together by quickly washing away the exuded starch. For each pound of pasta, you’ll need about 4-6 quarts of water. Using a small pot would mean lesser water which will cause the pasta to stick together. You may have heard that you can avoid sticky pasta by adding oil to the pasta water. This can prevent sticking, but pasta that's cooked in oily water will become oily itself and, as a result, the sauce slides off, doesn't get absorbed, and you have flavorless pasta. Adding oil may keep the pasta water from bubbling up and boiling over the rim, but this can also be achieved by making sure you use a large pot. This is a much better solution than greasing your pasta and sacrificing flavor. 2. Salting the water makes pasta taste better by bringing out the natural flavor of the pasta. Add plenty of salt, about 2 tablespoons of kosher (coarse) salt per pound of pasta. This may seem like a lot, but it is necessary for getting the pasta properly seasoned. Plus, most of the salt drains off with the water and won’t increase the sodium level of your recipes. But do not add your salt until the water has come to a full boil. Unsalted water has a lower boiling point than salted water, so it will come to a boil a few seconds faster. Salt also dissolves faster in hot water. Undissolved salt crystals in cold water can leave small white spots on the surface of your stainless-steel pots. 3. To keep pasta from sticking, stir during the first minute or two of cooking. This is the crucial time when the pasta surface is coated with sticky, glue-like starch. If you don't stir, pieces of pasta that are touching one another literally cook together. Frequent stirring while the pasta is cooking will also help prevent the pasta from sticking to the bottom of the pot. Cook the pasta uncovered. 4. Don't rely too much on the pasta package to give you the correct cooking time. Start timing when the water returns to a boil. Most pastas cook in 8-12 minutes. Test pasta for doneness after about 5 minutes of cooking. Bite into a piece of the pasta. Pasta should be tender but still firm when you eat it. It’s what the Italians call "al dente." Watch the cooking process of the pasta carefully. Pasta can overcook very quickly. Pasta will continue to cook and soften even after it has been taken from the water. 5. Drain immediately into a large colander standing in the sink, and then pick up the colander with its contents and shake it well to remove excess water. Don’t rinse it unless you're going to use it in a cold dish. Rinsing the pasta after cooking can cool the pasta and prevent absorption of the sauce. It will wash away any remaining surface starch which can slightly thicken your sauce and can also help the sauce stick to the pasta. If you're going to toss the pasta with the sauce immediately, sticking shouldn't be a problem. What an interesting sauce for spaghetti! Sounds spicy! I'll have to try it! Delicious recipe - Yummy and spicy! I loved hearing your info on your last posting about the award. I agree about the motherhood part. You have quite a varied background. This spaghetti recipe looks interesting- I think people think it is weird because of all the conditioning that spaghetti is like Italian style. 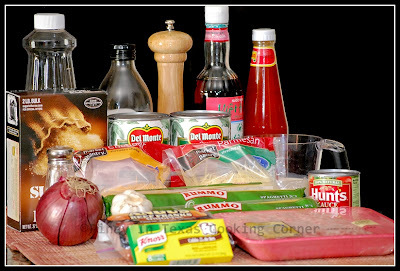 I just heard about Filipino style spaghetti a couple weeks ago when I was looking over another Filipino woman's blog- I'm sure my kids would love it because of the sweetness. I will need to try to find Banana Ketchup- maybe at the Asian market. I didn't even figure out until I was reading your blog previously that Pinay means Filipino. I have some friends who live in the Philippines as missionaries and my dad talks about his 3 wk visit there when I was young. I would love to visit someday. I also love the cultural/personal background you give the writeups for the various dishes. Keep up the good work. Hi Sarah! I really appreciate you dropping by and leaving a comment! Hugs!!! Oh my gosh! thanks my husband took one look at this and said you've got to learn how to make spagetthii the way my mom did. The water is for boiling the pasta. Most spaghetti packaging suggest to use 4-6 quarts of water to cook 1lb of spaghetti. My recipe calls for 2lbs of pasta that's why I said 8-10 quarts. my apologies ms. tina. i just got confused. i tried your spaghetti the time i asked you about the amount of water. i put in 4 oz of water to the ingredients as i thought that water is for the recipe. I just made 1 lb of pasta. My son loved it. He said it tasted like the spaghetti in the Philippines which he misses a lot. I tried your caldereta too and it was delicious. I tried your saba con yelo and i added sago to it. The recipes that i tried from you were all a success. Thank you so much for all your help. Please add some more recipes. I'm so sorry again for the confusion. No problem. :) It was my mistake...I didn't indicate what's the water for. Thanks for always visiting PiTCC! Truly glad to have you here! Great post! I'm third generation and for some reason- I don't remember ever trying Filipino spaghetti! This recipe looks quite delicious and I've seen this on other blogs as well. I've heard that the spaghetti tends to come out sweet. 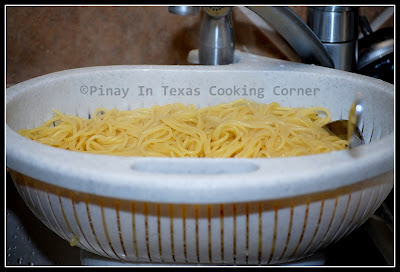 Is this common for Filipino spaghetti? Also, how would you suggest cutting down the sweetness since traditional spaghetti tends to be savory? That's how Filipino spaghetti differs from the original spaghetti...it's sweet! If you don't want it to be sweet, omit the Filipino Ketchup and sugar.